Polarn O. Pyret are one of my favourite brands. I first discovered them when I was pregnant, shortly after I discovered Katvig. When you discover one Scandi brand, you soon find many others! PO.P are not new though, they've been making children's clothes for over 35 years, and it shows! If you have heard of PO.P before, then no doubt stripes pop (haha...I know...) to mind. I know I think of bold stripes when I think of them. Classic, bold, unisex styling and practical to boot. These days PO.P stock a classic range as well as new styles for each season. Over the last 3 years Ethan has had a few PO.P items. 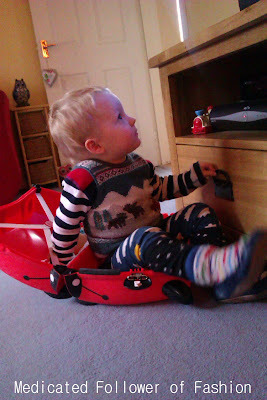 He had several stripy vests/body suits which were lovely - nice and bold but also washed very well. Good quality cotton. At the moment he has three PO.P items in his wardrobe, a clown face t shirt, a long sleeved top and a pair of leggings with a sun and cloud print on them. He loves those, as do I, and whenever he wears them he gets heaps of compliments. I'm afraid I haven't any brilliant photos of Ethan wearing these, this is the best I could do! Anyway, I really do love PO.P clothing and if you haven't discovered them before now, I'm sure you will too.. which is why I'm extremely excited to announce a new competition! The lovely folks at PO.P are offering up a fantastic prize for one lucky reader - one of their classic (and famous) fleeces in the size and design of your choice! Not seen one of their fleeces before? Take a look at these beauties! Child fleece in Poppy. Images from PO.P website. "Windproof and water resistant fleece jacketMade of soft fabric that is breathable, warm and lint-freeThe jacket has 360 reflectives and striped zip pull reflectorsChin cover to protect against the zip from chafing. Sleeve cuff has thumb holes to keep arms coveredPre-bent sleeves for increased mobilityThis jacket can also be used as an alternative to a thick sweater. Special poppers that connect the fleece to the Wind and Waterproof jacketsWash inside out with zip and velcro closed to protect the reflectors and edging"
I have it on good authority (from my contact at PO.P) that these fleece jackets are "virtually waterproof" after her children came back bone dry after a bike ride in a downpour. Useful to know! What do you have to do to be in with a chance of winning? It's simple, just click on the rafflecopter entry form below. You must leave a comment after this blog post as a minimum (telling me which colour you would pick!). If you want to gain extra credits for a higher chance of winning, you can earn extra credits using the rafflecopter form. Good luck and don't forget to tweet all about it! PS - Check back on Monday 21st May because I have some extra info about PO.P that can't be released until then!! The red one looks great :) if I had a girl I love the polka dot one too! These are fab :) Sephie would love the dotty one! £39 is a lot of money for something they will undoubtedly grow out of in a couple of months. Surely that money would be better saved for their healthcare of education! 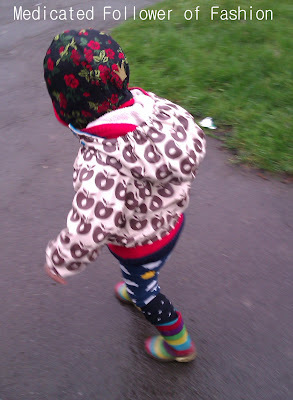 Whilst I agree that £39 is a great deal of money to spend on an item of clothing for a child, I do have to argue that PO.P clothing is exceptionally good quality - also, with a coat/jacket, it does tend to have a longer "wardrobe life" than a couple of months. Unless your child grows extremely quickly! For example, the coat Ethan wears at the moment has been in use for well over 8 months and it's still got plenty of growing room. The coat he wore before that lasted him well beyond a year. They will still be in good enough condition to pass on to a future sibling and maybe even my grandchildren one day - after all Ethan wears clothes that my brother and I wore (and my cousins wore before us in the 70s). All this is irrelevant here though really because I'm not asking anyone to go and buy it, simply enter a competition to have a chance to win one!! I would have to go with the Poppy colour, these ARE good value as generally last forever and are very good for passing down for siblings as most designs are unisex. I think Sam would look fab in Red! I love the dotty one but its a bit too girly. I love P.O.P. I can't decide between orange or citrus though - both fab!